Nia Robinson jumps to hit the ball. The sophomore outside hitter and the Wildcats struggled throughout the 3-0 loss. Before Northwestern’s third game at Welsh-Ryan Arena had even started, Illinois’ fan base was cheering so loudly for the Illini that it felt like they owned the place. The Wildcats responded with 24 of their most high-energy points of the year to keep the game tied at 12 in the first set, but after that No. 4 Illinois (25-3, 14-3 Big Ten) outscored NU (15-14, 5-12) 63-29. 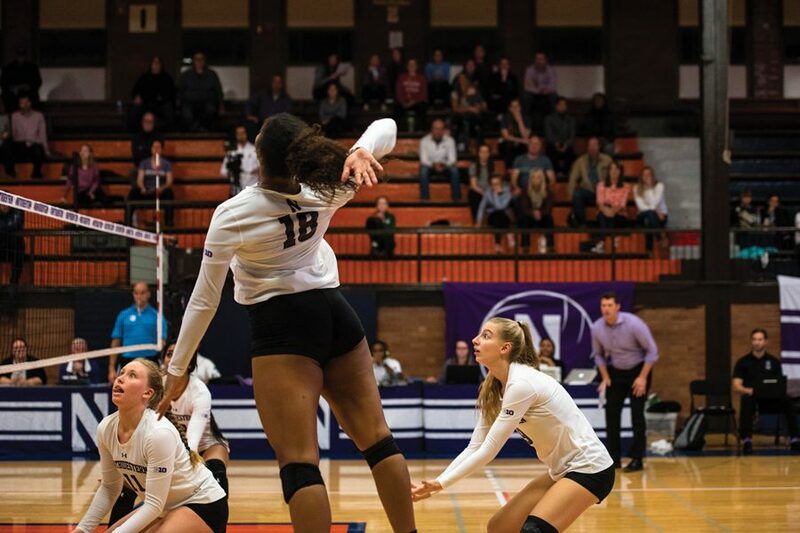 After beating Rutgers on Saturday, outside hitter Nia Robinson said this was one the Cats needed to prove their ability to compete with top Big Ten opponents, but after the 3-0 loss coach Shane Davis said he’s looking for answers. After tying the game early, the Cats committed 10 errors in the rest of the first set. Davis said the skill and cohesion of the highly ranked Illini was greater than the Cats, who committed ten more errors than Illinois over the course of the match. Three Illinois players had nine or more kills, while outside hitter Abryanna Cannon led NU with six. Against what she called one of the best organized units she’s seen, libero Emily Ehman said the Cats didn’t have a good counterpunch. Especially in the second and third sets, Davis said the Illini were incredible at controlling the pace of the match with their consistent returns. A positive return for NU was setter Britt Bommer, who had a steady performance in her first game back from a three-week injury. Bommer has consistently been the team’s leading setter during the season, and she tallied 15 of NU’s 16 assists as well as a kill against the Illini. With three games left in the regular season, the young Cats are still working to figure out how to best take advantage of the team’s strengths, according to Ehman. Also, Davis said Bommer will have to continue to compete in practice to solidify her starting position after returning from injury. Before an upcoming matchup against Penn State, who swept NU 3-0 at home last Friday Ehman expects the team to watch more film in hopes NU can finally find the spark it’s been missing.